I have been around computers a long time. In high school, in 1967, I started playing games on a timeshare computer that my high school’s chemistry department somehow obtained. It was in a slender room, more like a large closet. There was no screen. Everything printed out to a teletypewriter. I have been around computers a long time. In high school I started playing games on a timeshare computer that my high school’s chemistry department somehow obtained. There was no screen. Everything printed out to a teletypewriter. To connect to the ‘mother’ computer you dialed a number then put the phone receiver in rubber cups on the modem. 1967. Wow, that’s a long time ago. My first personal computer was a TRS-80 Model 1. That was 1979. There was no floppy nor hard drive. No printer either. You couldn’t connect to anything. It wouldn’t have mattered. The Internet hadn’t been invented. Programs were loaded in via a cassette deck. It was a terrible method terribly implemented. The computer had 8 Kb or RAM. The laptop I’m typing on has 3Gb. That’s 375,000 times more! The TRS-80 had no practical purpose. It helped establish there would be a market for personal computers. It was loads of fun. I remember my brothers first computer….how things have changed. When my son was 13, he asked me to go half in with him ($$ of course) so he could build a computer. I was not sure if the boy could even build it, but I figured why not support his creativity. It was the coolest, with led lights in the tower, and four fans to keep the sucker cool!! ….and of course it worked. Through the years his “hobby” helped him earn money in High School, College, and eventually land the job he has now, since he could not find one in the field he majored in. (music and sound recording) He just passed his A+ certification (which the company will reimburse him for) and is getting ready to take another course……you never know where a hobby will take you! We had a TRS-80 at work my first year of teaching 30 years ago. You’re right, it didn’t do much! I think we entered databases. My first classroom computer was the Apple IIe with 4 MB of ram and a 140 MB hard drive. We thought we’d never fill it up! We played on a Digital the math department had at high school – two TTY’s and a printer. 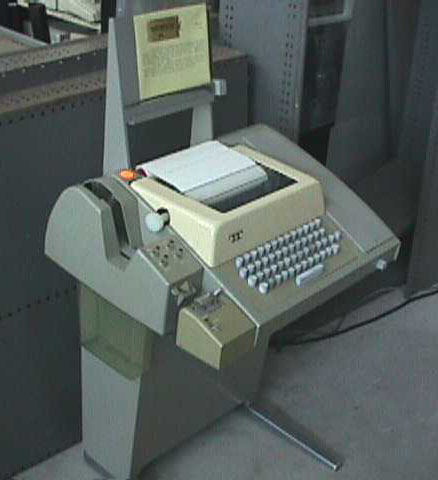 We also had a punched tape reader! In my Senior year, they bought a card reader 🙂 My first personal was a Sinclair ZX81 I bought as a kit in 1980 and assembled myself. It had a 16K ram module included, and it hooked up to the TV. You could also save and load programs using a cassette tape deck, but I never had much luck with it. Never had the pleasure of owning a “Trash 80” computer. My first was an Atari 400 with the SPEEDY 300bps MPP-1000C modem. I had NO sort of drives for it….just a cartridge slot. The s/w for the modem was cartridge-based. I was accused, by some of the local “pirate boards” (back in Kansas City) of downloading all their programs and not reciprocating. Hard to do when you have no storage device! Stayed with Atari’s for a while, then upgraded to an AWESOME Panasonic 8088 based system. Those were the days!!!! This is cool! 🙂 My family couldn’t afford a TRS80, but I played with the one in the local Radio Shack most days after school! The manager didn’t mind, as it was good for business, to see a “kid” using it like I did! 😉 I taught myself programming in BASIC. I can identify with this, Geoff. Freshman year of college in ’71, I learned to use the same remote terminal and also a simple desktop computer. Desktop in that it was about the size of s dorm refrigerator, had four memory “buckets” and you inserted a mag card to save your work. I never had a TRS80 but did work for the company that marketed the Adam — a prescient product unfortunately manufactured and marketed by the wrong company. 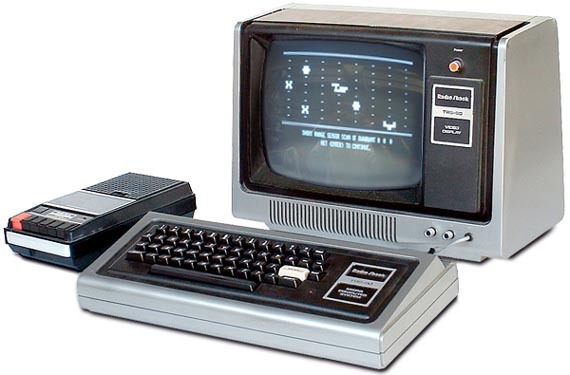 I also had a TRS-80 Model 1. It had 4Kb of RAM. I wrote a program to track my softball team’s stats on it. I had to use single-letter variable names to save RAM. I paid $70 to upgrade it to 16Kb of RAM. Eventually a chip in it went bad and every 60 seconds it would blink and flush memory which severely limited it’s already minimal utility. I still have it in my basement, along with every other computer that I’ve had since then. I got into a huge fight with my father when I bought it. He thought it was a waste of money, but without it I wouldn’t have switched majors from Mechanical Engineering to Computer Science and I wouldn’t have the job that I have now 30+ years later. My first computer experience was in high school – a half semester course on ‘programming’. It was punch cards and a board that resembled the old phone operator’s board with all the wires. We would ‘program’ the board to run the routine, and the teacher had to take it to City Hall at night to run it. We wouldn’t know if it worked until the next day, or maybe the day after. If City Hall needed the computer, our stuff didn’t run. Now we complain if the system hangs up for 10 seconds! I had a Commodore 64 with a cassette drive. I remember spending HOURS typing in a program from a magazine and then having the thing crash when I went to save it to tape. ARGHH! Still makes me frustrated remembering. 🙂 The most useful addition I made to that C64 was wiring up an external reset switch so I could reset it without powering off/on. It crashed a lot. I remember having a color TRS 80 in the early 80s.. maybe 82… I think I recall the computer coming with offers to join Compu Serve.. Could that be correct? I started out writing basic programs on our school computer, back in 74, paper tape for imput, Helped program a TRS-80 for a campaign and had a c-64 for my first home computer. The Radio Shack pc comparable. Connected to CompuServe on that c-64, all on a 300 baud modem. Previous Previous post: Nothing Is Ever Easy!